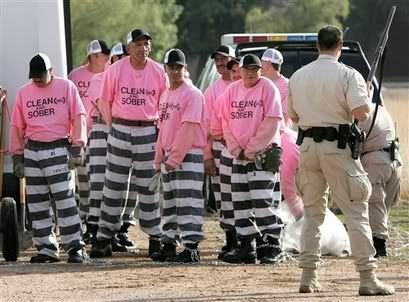 Members of the Maricopa County DUI chain on a work detail as deputies gurad them Tuesday, Dec. 11, 2007 in Phoenix, Az.. Men convicted of drunken driving will don bright pink shirts and perform burials of people who died of alcohol abuse as part of a new chain gang in Phoenix. A sheriff's dept. spokesman said the DUI chain gang is the first ever that's dedicated to one type of crime. What do you think? At first glance, the pink color seems like it could work well as a humiliation tactic. Sure, it's just a color, but it 'does' tend to have certain associations/connotations to it, so for those wearing the pink shirts, it could certainly have an effect. But would that effect help remind them not to drink and drive? Probably not. And it may or may not be an appropriate punishment for their crimes. The second portion of that, though....performing burials of people who died of alcohol abuse? Uhhh. I'm not even sure how to comment on that, but I can definitely see it bringing up some controversial discussions. After all....should they be performing burials 'at all'? I can see families of the deceased questioning whether they are okay with convicts burying their friend or relative. Will they be donning those bright pink shirts and striped pants or will they be in something less...out there? Will it be done in chain gang form with several of them out there doing it? And all that aside, will it really encourage them not to drink and drive again? Is that Tom Tancredo? He's pretty great. He's done some pretty wild things. Hey, thanks for the link. They're wearing pink underwear, too?? I had no idea! Lol. I'm sure he had to get the permission of the families of the people being buried. If not, it's a little presumptive and a bit offensive. But that's Maricopa County for you. He doesn't mind offending people, and his wacky tactics actually work sometimes. Which is kinda the point of putting someone behind bars - getting them to change their wicked ways. Or whatever.